A review of side effects from Radiation and Chemotherapy for head and neck cancers. Radiation therapy (or radiotherapy) is the medical use of ionizing radiation as part of cancer treatment to control malignant cells. It is used for curative, adjuvant, and palliative therapy, and is often combined with surgery, chemotherapy, and hormone therapy to fight the cancer. Medium and long-term effects of radiotherapy include dryness of the tear and salivary glands, hair loss, and fibrosis. Fibrosis is the tightening of tissues over time from a diffuse scarring process. Fibrosis of the face, jaw and neck can lead to trismus or the limiting of mouth opening. Jaw motion rehab devices, like the OraStretch® press, is commonly used to stretch the jaw to prevent radiation induced trismus and to overcome trismus. 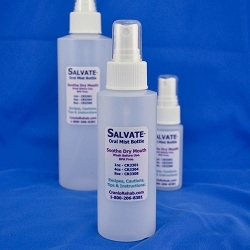 Salvate™ Oral Mist Bottle - Home Kit - 1 x 8 oz, 2 x 4 oz & 2 x 1 oz Misting Bottles. Radiation therapy is generally painless, and side-effects generally increase with the dosage. Side-effects can occur during treatment, months or years after treatment, and after re-treatment. 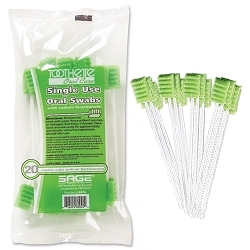 During treatment the lining of the mouth, throat, esophagus, and bowel may be damaged by radiation. 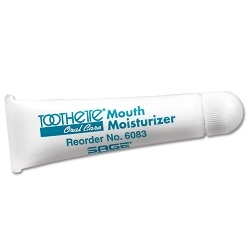 If the head and neck area is treated, temporary soreness and ulceration commonly occur in the mouth and throat. If severe, this can affect swallowing, and the patient may need painkillers and nutritional support (See liquid-diet for more information on liquid and soft diets) . The esophagus can also become sore if it is treated directly, or if, as commonly occurs, it receives a dose of collateral radiation during treatment of lung cancer.